﻿ Battle of the Sexes Revisited | Christiane Northrup, M.D. With all the bad news dominating the headlines, it’s no wonder that an unprecedented number of people are experiencing stress. Stress, like any other emotional issue, manifests in the body to get our attention. When you’re anxious and worried for long periods of time, it’s common to experience muscle tension, sleeplessness, anxiety, headaches, high blood pressure, fatigue, and other conditions. People are also more irritable, quicker to anger, and even depressed. Men and women cope with stress differently. Men are likely to isolate themselves, whereas women are more apt to comfort others and seek help. So which way is better? According to a study done by the American Psychology Association in mid-2008, women were more likely to be affected by stress due to money and the economy than men. Psychotherapist Jed Diamond, author of Male Menopause and The Irritable Male Syndrome, believes the opposite is true. His reason? Men are more isolated and more likely to have a smaller social support network. “I’ve often said that community equals immunity. The Friendship Study demonstrates that women, because they cope with stress by seeking out others, are more likely to stay healthy during times of prolonged stress. They’ve got the feel good hormone oxytocin on their side. Studies have also shown that social support provides protection against heart disease, mental illness, and many other health conditions—all while boosting the immune system! Having a connection to Spirit does the same thing. Dr. Northrup continues, “I always tell men that if they want to live longer, hang out around good women who are fun and nurturing—and know how to treat them like the heroes they are. Thankfully, at midlife and beyond, men are more likely to turn their focus to their families, their communities, to hobbies, and places of worship, therefore widening their support network. This gives me every reason to believe that both sexes will ride the wave of this current crisis and come out stronger. In fact, statistics show that the mortality gap between men and women is getting smaller. It used to be that men died on average seven years before women. Now it’s down to five. 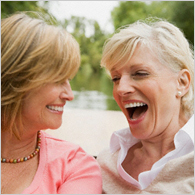 The Secret Pleasures of Menopause by Christiane Northrup, M.D. The Secret Pleasures of Menopause Playbook by Christiane Northrup, M.D.